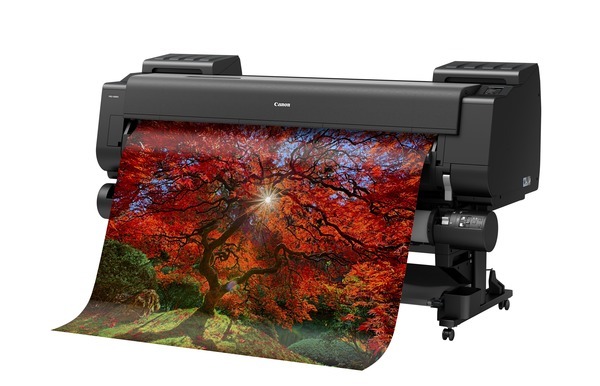 The Canon ImagePrograf Pro 6000s is a large format, high-capacity printer that prints images of 60 inches, which places it as an ideal option for printing commercial signage. The roll feed style machine can handle a maximum roll print length of 59 inches so there is a lot of scope for making a desired sign to a high standard, as and when necessary. Though set up takes a little work initially, it will eventually prove to be worth it. The Canon ImagePrograf Pro 6000s needs some room as it is a big machine with dimensions of 46 x 78.7 x 38.7 inches when the basket is open. The area in which it is placed is also relevant when it comes to temperature as it requires an operating environment that is between 59 to 86 degrees Fahrenheit. The paper feed accommodates a single roll that is front loading. With a print resolution of 2400 x 1200 dpi, the eight ink colours help to create clear images. The ability of the Canon ImagePrograf Pro 6000s makes it possible to make savings from not needing to use an external company when you need to make a sign. The maximum roll diameter is 6.7 inches, which makes it a printer that can get a lot of work completed before needing to replenish the paper. All the software required to immediately get started is included as part of the package, and as such the printer will be ready to go after setup. The Canon ImagePrograf Pro 6000s is big and it is capable of producing some big prints, which means it needs to be placed carefully to ensure that the print roll has sufficient space on release.